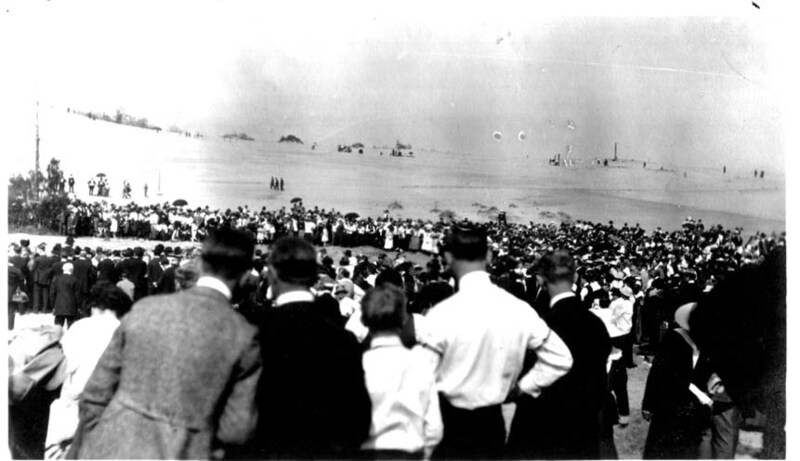 Poor Mojo's Classic Fiction: Fritz_Swanson "The Beach Event"
It started with a rope in the sand. The couples had come to the lake-front for their constitutionals, and the fresh air, and the autumn breeze wet with the last kiss of summer blown in from ports as far away as Manitowoc on the Wisconsin shore. The Ludington ferry, fat with freight cars, slunk along the horizon. As it sunk out of sight, fading into the buttery glow of the setting sun, the ferry took with it the last hints of the modern world. But no one noticed. They all had their backs to the lake and the sun and the lapping surf. They had come to the rope in the sand two by two, the evening strollers with their pork pie hats and their parasols. The dune grass and the shimmering, shadowy sand hissed in the breeze, which had slipped fast across the beach to the rope. As the crowd formed, people started to whisper. The rope didn't seem to have a beginning, and it didn't seem to end. 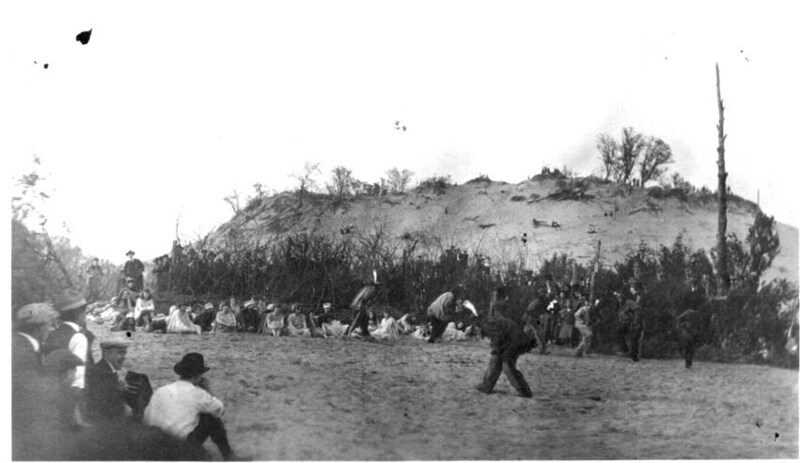 It stretched on up the beach north to the bluffs, and the curving shore line, and the pipe-smoke curl of the stacks of Ludington. It reached on south to Grand Haven, Saugatuck and beyond. It didn't quite rest in the sand, but was pulled above it like a telegraph wire. And the closest of the people, the sunday dandies with their shoes pulled off and their slacks rolled up to mid-shin who inspected the rope with feigned wisdom as their ladies stared on from a safe distance, they heard the rope humming faintly. At first the hiss of the breeze masked the humming, which was much more of a tender sensation in the lower bowels than a proper sound. But then, if an ear was cocked, the unmistakable thunk of a slowly building dactyl rhythm could be discerned. As the sound increased, the rope began to take on the character and intensity of the sound. With each accent, it twitched, a snake smelling the air.With each falling beat, it seemed to thicken as all of the fibres of the rope pulsed with a low groan. Twitch groan-groan, twitch groan-groan. Along with the rhythm, the sand adjacent to the rope became disturbed. Cavities opened, and sand sprayed out in clean little arcs. The crowd pulled away in unison, parting as though before a great parade of unseen marchers who beat with their feet a matching cadence into the sand along the demarcated line. Then the first savage appeared. His head was bowed as he traced the beating steps of his transluscent comrades, the great black and white feathers of his skull-cap dancing a counter-point to his lurching, and progressively syncopated march. He wore breeches of deer hide, sewn with gut and fringed in an awe-inspiring grotesquery of feral teeth and smooth glass beads. 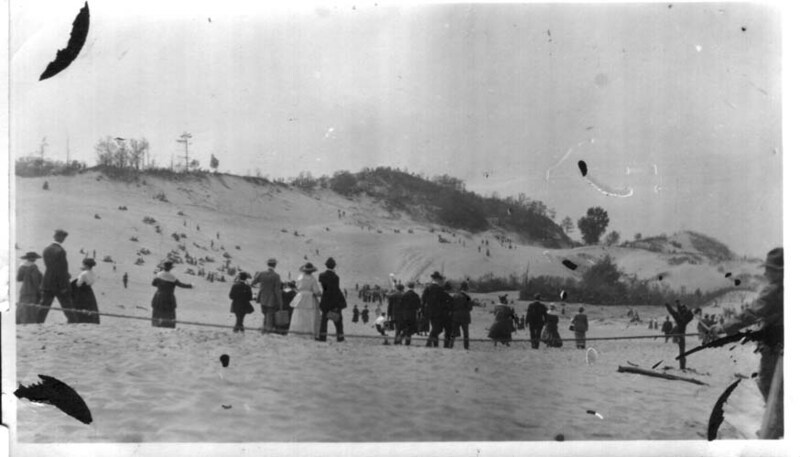 Taken aback by the apparition, the men in their shirtsleeves and the ladies with their hats pushed back fell to the pillowed hillocks of the beach and the dunes. The lone savage, his knees arching and his leather shod feet skipping, began to swing his torso to a progressively more esoteric oscillation of the spirit. As his hands flourished and his low singing carried across the open air, sibling shades faded into view. 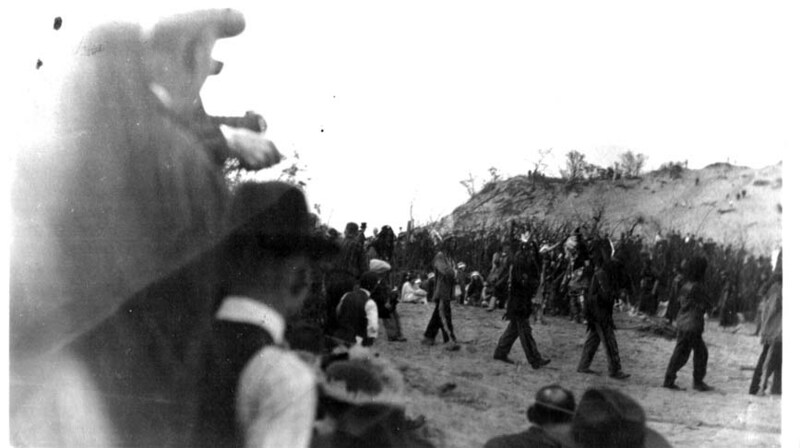 Bands, tribes, whole nations coalesced in time to the mournful march of the rope dance. Chieftains with their crimson skulls, and alabaster chest paint; braves and war-lords, their hatchets twirling, the horse-hair of their crested roaches swaying tall and proud; shamans cloaked as bears and stags and ebon crows swirled at the periphery of the weaving and circling thread of dancing red men. As if in sympathy of the gathering horde of savage men dancing their native dance, a throng of ghost-white vacationers encroached upon the scene. They wore shirt-sleeves with arm-garters; warm hunting jackest of worsted wool; the ladies in whale-bone girdles and high-button shoes, their gloves of hand-crocheted lace, their hats imported from the shops of canaled France. These newly arrived whites, slack in the shoulders and amiable to the prospect of some new diversion gaggled and gawked at this mighty congress of native warriors and their pibroch. The rich scents of Turkish perfumes, powdered cheeks, starched cotton collars and oiled leather mingled in the corpse-wet air of the autumnal lake at dusk. 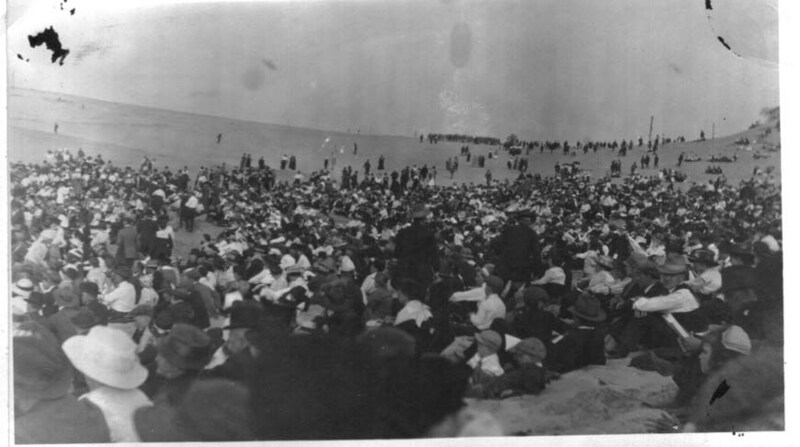 The crowd spread across the beach, pushing up the sides of the dunes and down to the water-line. It came finally that at the outer edges no one could see or understand, and each man turned to his neighbor and asked of what sort was the commotion at the center of the gathered mob. Was some atrocity occuring? Or some wonderful sport? Either seemed as good as the other to the men on the outskirts, who felt that their station must be so low that they had been relegated to the very frontiers of civilized assembly, and if that were the case then a bear bate was as likely and as acceptable to them as a learned debate. After a while, these lesser men and their women felt confirmed in their suspicions of yet again being locked from the importance of the event. The reasoning for their exile had long since ceased to matter and they fell upon their ancient prejudices against the educated and their efete ways. In the face of this, perhaps perceived, injury of status, paraded as it was before these men's wives and companions, the men started their own attractions in the sloshing water of the lake shore. For poise, they instigated impromptu boxing matches and other less amiable forms of pugilism, their white sunday shirts wripping beneath the cascade of knuckles and blood. Whole swirling distractions of this sort formed all around the main mob, the men stripped to the waist in the circles of jeering of crowds. They wore only bowler hats and sneers. All was metronomically coordinating by the ever growing pulse of the rope dancing that spiraled to a kind of ecstatic peak at the heart of the mass. The fists and the moccasin feet and the shaking gourds full of pebbles and the cries of pain and submission all merged in time. First, their was a silence that swallowed the whole of the beach. The waves stopped and the sun paused in its procession down below the horizon. Fists and feet and wagging feathers all floated in the air together, pulled up by the many strings which had kept them all so seemlessly in time. People, as in some chemically burned snapshot from a Brownie camera, were frozen in their poses. Crouched men, stretching ladies, savages dancing, boxers in mid-receipt of bone crushing blows, the yelping dogs, gulls in their slow-circling, clouds against the dimming backdrop of an evening heaven, the white crests of waves half broken against the shore. The whole of the world took a breath, and the rope, taut along the sand, tightened until it seemed it would snap. Then, as though the world had been bluntly spliced into some new reality, their was no rope at all. In the end, there was only an ungainly mob on that beach; a mob of men and their wives and their dogs and their weighty anxieties over the future, heavy like suits of wet wool. They had come to the beech for its emptiness, for its pristine perfection, for the clarity of the air and the purity of the unspoilt waters. They had come for the sunset, and for the hands that they might hold. They had come, all of them, to the beach on the western short of the state to be together and to be alone. That beach had always been empty. They were sure of it. Nothing at all had happened. But each man, in his own heart, imagined that he might have come to sit where he sat to see something more than sand and green glistening beetles. And so they all together, and indvidually, rested there staring at an empty corridor of gray autumn sand which divided the mob in twain like a deep and careful cut in the fabric of the earth.